This was the important lesson learned by a small entrepreneur at the helm of Nature’s Bounty, the only store in Cagayan de Oro offering organically grown food. A decade ago, Boy Cortez urged his wife Ann and three of his friends—Pinky Baclig, Butch Alano and Apollo Pacamalan—to explore the potential of organic rice trading. “I wanted to set up a business with a social conscience,” said Cortez, himself a farmer before becoming a professor in the Bukidnon Community School of Agriculture. Being involved in NGO work mostly in the rural areas, Cortez had been exposed to problems confronting small farmers. He and Apollo had been engaged in training small farmers on organic farming and saw that one of the pressing concerns is the lack of marketing. It would be the third reason that seemed most urgent for Cortez and his partners. “The farmers were at a disadvantage because it is the landowners, the traders and brokers who got the bigger share of the profits and they get buried in debts because of high cost of farm inputs and production,” he said. After saving up a small capital, Cortez and his partners eventually set up the Bukidnon Organic Products Corporation (BOPC). “Our objective is to provide a marketing arm for organic farmers,” Cortez said. Like all straggling businesses, BOPC in its early years had to contend with market development. “At the start, we had to rely on our friends, colleagues and the NGO circle to sell our products. We did house-to-house selling and depended on word of mouth,” Cortez said. In 2003, the Philippine Development Assistance Program (PDAP) approved a loan for BOPC for market development. The loan program, funded by the Canadian International Development Agency (Cida), was composed of P2-million package for market development and P100,000 grant for administration and mobilization. “It was a lifesaver for us,” said Cortez, who immediately sought the help of marketing experts to promote the organic products. A modest store outlet was constructed in the heart of the city where health-conscious citizens could drop by any time. The product name Nature’s Bounty was eventually introduced to the public and immediately earned the attention of consumers. “The name Nature’s Bounty reflected the loving care and sacrifices of farmers to cultivate nature and produce these natural crops,” he said. 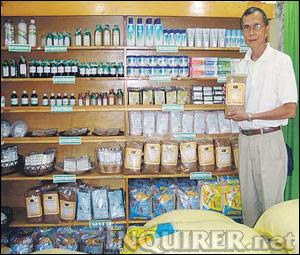 “We strived to take the products to the buying public,” said Manny de la Peña, sales and operations officer of BOPC. “We had direct suppliers among small farmers. We bought their crops at a higher price. They were happy to have been well compensated for all the hard work they did to produce organic crops,” he added. The leap in market development took BOPC in another dilemma. “The supply could not meet the demand. Bulk orders were coming in and we had no choice but to turn them down because we were short in supply,” said Cortez. PDAP introduced them to a network-member under its PRIME project, the Malahutayang Kahisuan sa Kababaginan sa Bukidnon Inc. or Makakabus, a farmers’ association composed mostly of women. The association agreed to till 16 hectares of land for organic rice. This provided BOPC with 100 sacks of organic rice. He added that in time, the farmers saw the viability of organic farming because there was no need to buy pesticides and fertilizers, and thus, they get to keep all the sales income. “The women were also good managers. They wanted to be paid in cash which was understandable,” he added. Eventually, Makakabus expanded their production area to 100 hectares. “All the products that we buy should pass the internal quality control system,” said Cortez, referring to the system they developed to ensure that all the products have zero pesticide and were grown only with natural farming. BOPC accessed free training for the small farmers to enable them to learn all about natural farming. “Now the farmers produce their own compost fertilizers. And we’re also now into a new technology called ‘rice and duck integration,’” Cortez boasted. Incentives were given to farmers whose products pass the quality control system. “For Makakabus members, 50 cents per kilo go to the association and 20 cents per kilo goes to the farmer,” Cortez said as he explained that this was part of BOPC’s way of motivating the farmers to work hard in ensuring the quality of their crops. De la Peña said that during the first years of BOPC, the company wallowed in huge losses. Over the years, however, sales increased at a slow but steady pace. “We enjoy at least 53-percent increase in volume and in peso every year,” said De la Peña, while acknowledging that this is far from the millions of pesos earned by commercial rice traders in the city. Fortunately, a national network of organic advocates has been helping BOPC in getting support for capitalization and technology transfer. “These are enterprise groups who are also engaged in organic products processing and marketing,” he said. This means farmers have a primary role in getting that organic food on the poor man’s table. “We need to convince, first and foremost, the farmers to turn to organic farming. Similarly, support from the community, the government is essential,” he stressed.